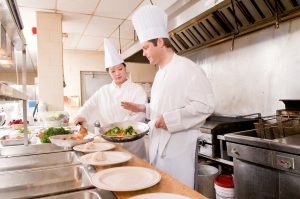 One way to ensure that you team has the clean uniforms that they need is to rent chef coats and aprons so that they are readily available at all times. The kitchen of a restaurant is often messy and hectic, especially on the busiest days of the week. Between cooking and preparing dishes, kitchen messes are almost always unavoidable in the restaurant industry. For this reason, this fast paced environment of messy tasks and hands on work demands durable, easy to clean uniforms so that your team is always well prepared with everything that they need. One way to ensure that you team has the clean uniforms that they need is to rent chef coats and aprons so that they are readily available at all times, allowing you to save money and easily maintain cleanliness standards for your kitchen. Why stress over uniform costs if you don’t have to? Uniform rentals are especially convenient for messy kitchens and teams that go through several chef coats and aprons per week. By investing in uniform rentals for your team, your staff will always have access to clean, professional, and durable uniforms without overspending on new ones. Particularly in kitchen settings, uniforms are an important aspect of upholding sanitation standards and professional appearances. As your kitchen staff works throughout the week, it is crucial that your kitchen remains clean and organized for the success of your restaurant. Cooking, preparing ingredients, and cleaning counters or appliances each day can turn your kitchen into a messy space, and clean uniforms are a great start to creating a clean and less stressful environment for your team. A professional cleaning service for your restaurant uniforms is especially helpful for removing food stains that may collect on chef coats and aprons throughout the week. One major benefit of chef coat and apron rentals for your restaurant is that your rental service also includes professional laundry services to keep them clean and looking great for your staff. Not only will your team look professional in freshly laundered chef coats, but they will also be guaranteed clean uniforms throughout the week. This entry was posted on Thursday, June 14th, 2018	at 11:54 am	. You can follow any responses to this entry through the RSS 2.0	feed. Both comments and pings are currently closed.